Full day outdoor theme park pass in Genting Highlands. 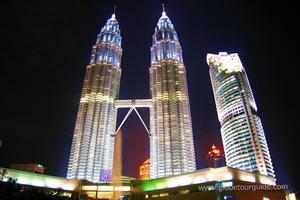 On clearing the immigration, you will be met by our local representative in the arrival hall at the Kuala Lumpur (KL) International Airport, who will arrange for your immediate transfer to Genting Highlands. . Check into hotel at Genting. Please note: Check-in time is 1500 hours; Early check-in is subject to availability of room. The afternoon and evening will be free for you to relax or enjoy amazing theme park rides (at your own cost). Overnight at hotel in Genting. After breakfast at your hotel, you will have the whole day to yourself. You will be provided a full day Outdoor Theme Park Pass. Overnight at hotel in Genting. Following breakfast, you will be checking-out of your hotel and will be transferred to Kuala Lumpur (KL). Check-in at a hotel in KL. The day will be free for leisure activities; you may relax or explore KL on your own, visiting its’ many shopping arcades; famous mosques, churches and temples; and pretty parks, including the UNESCO World Heritage Site – Kinabalu National Park. Overnight at hotel in KL. Breakfast at hotel in KL. This will be followed by a city tour where you will be either driving past or visiting some of KL’s famous landmarks, such as: Istana Negara – the King’s Palace, Houses of Parliament, Lake Gardens, National Monument, Federal Court – highest in the country, Merdeka or Independence Square, world-famous Petronas Twin Towers, National Museum, Beryl’s Chocolate factory, and Batu Caves – a tourist hotspot. The afternoon will be free for those who wish to shop. Overnight at hotel in KL. Following breakfast, you will be checking out of your hotel at KL and shall be transferred to the KL International Airport to catch your scheduled return flight to Delhi.